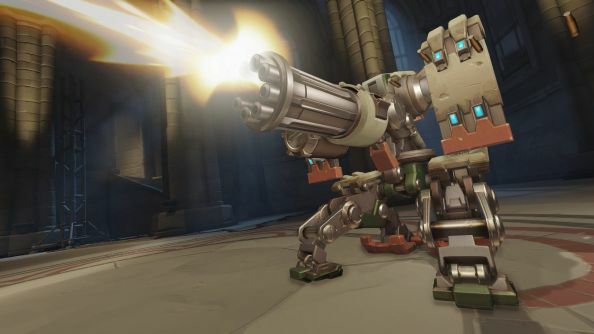 Stack buffs onto Bastion – whose turret mode minigun has the highest sustained DPS of any regular attack in Overwatch – and there’s not much in the game you can’t kill. As a Redditor named thegoochalizer discovered, that even applies when players are being healed by a Zenyatta ult. There are quite a few damage buffs available in Overwatch now. In Thegoochalizer’s clip, a player named Tismo receives Ana’s Nano-Boost and Orisa’s Supercharger, and shoots through Baptiste’s Amplification Matrix. All of these have been added post-launch, reflecting just how much the game has changed – this wouldn’t have been possible in 2016. Under the influence of all these buffs and looking to push the payload through a tunnel in King’s Row, Tismo switches to turret form to clear out the roadblock. They kill a Zarya and then a Reinhardt with no difficulty before Zenyatta triggers his ult, after which they polish off a D.Va mech, an Ana, and then D.Va herself. Zenyatta’s ult heals 300 health per second, affecting all allies in a 10-metre radius. Certain attacks can overwhelm this with crazy one-shot, or ‘burst’, damage, such as a Widowmaker headshot or ults like a Tracer or D.Va bomb, but Bastion is probably the only character who can do it with sustained DPS. In turret form, Bastion’s fire rate is 30 rounds per second, and each round can do a maximum of 15 points of damage (assuming ideal range). This means ideal DPS of 450, which is enough to overwhelm Zenyatta’s ult healing without buffs… but obviously, they help a lot. Ana’s Nano-Boost and Orisa’s Supercharger both add +50% damage, while shooting through Baptiste’s Amplification Matrix doubles it. Assuming these buffs stack additively, that means Bastion could be doing as much as 1350 damage-per-second in this clip.